of East Yorkshire Champions. However, the team were to bring home some silverware, with a comprehensive performance at the HMC sixes, winning every match with aplomb. Our U14 cricketers were arguably the best sporting team in the School in 2018; they embraced working collaboratively and collectively to achieve team success. development and well-deserved. George Clark led the team well. Tom Jeffers continued from where he left off last season and was very good with both bat and ball. 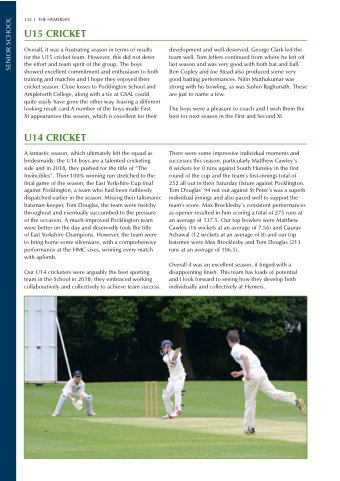 Ben Copley and Joe Stead also produced some very good batting performances. Nitin Muthukumar was strong with his bowling, as was Sashin Raghunath. These are just to name a few. The boys were a pleasure to coach and I wish them the best for next season in the First and Second XI. 8 wickets for 0 runs against South Hunsley in the first round of the cup and the team’s first-innings total of 252 all out in their Saturday fixture against Pocklington. Tom Douglas’ 94 not out against St Peter’s was a superb individual innings and also paced well to support the team’s score. Max Brocklesby’s consistent performances as opener resulted in him scoring a total of 275 runs at an average of 137.5. Our top bowlers were Matthew Cawley (16 wickets at an average of 7.56) and Gaurav Achawal (12 wickets at an average of 8) and our top batsmen were Max Brocklesby and Tom Douglas (213 runs at an average of 106.5). Overall it was an excellent season, if tinged with a disappointing finish. This team has loads of potential and I look forward to seeing how they develop both individually and collectively at Hymers.